CSG recently released its global market survey, Digital Future Report: Sports Streaming Edition, that polled more than 2,000 18-64 year olds to evaluate when and how sports fans watch live sports. Streaming sports events on mobile devices are becoming increasingly popular as people look to enhance and personalize their viewing experience. 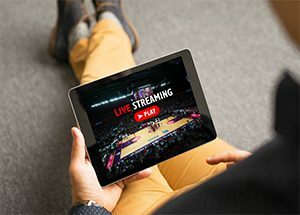 Currently, 71% of global consumers watch live sports with a cable subscription, while 18% use digital channels to stream, and 11% use mobile trailing. The survey suggests that consumers would be willing to pay more for fewer ads, split screen access to watch multiple games, personalized content and live stats. 69% of sports fans prefer to watch the game at home, while 14% like watching at bars or restaurants and 8% prefer stadiums. 32% of viewers would personalize their viewing package for less intrusive advertisements and 28% would tailor their experience to the teams they care about. While live sports providers are exploring the potential for VR/AR, 69% of consumers are not interested in a VR/AR viewing experience. Of those that are interested in VR/AR, 44% are Gen Z and millennials.